We did it… and survived. In fact, it was an all-round success (pretty much; see below for caveats). Yes, the TetZoo-themed event of the year – TetZooCon 2018, organised by myself and World’s Joint Most Influential Palaeoartist John Conway – has just happened and I’m now back at home and buried in all the other work I managed to avoid by organising a grand, two-day conference and associated fieldtrip. TetZooCon has now been going for five years, and as the fifth of these events, this one felt a little bit special. TetZooCon 2018: the first one to be more like an actual convention, or conference. Left to right: Caitlin Kight, Hanneke Meijer, Darren Naish. Image: Xane/Michael Lesniowski. Indeed, TetZooCon 2018 was ambitious – possibly over-ambitious. In addition to a long list of talks, the event included a Palaeoart Workshop, a special session on talks devoted entirely to bird evolution, a bird evolution roundtable event, a Speculative Biology on-stage discussion, a quiz, a conference meal and drinks reception, and a post-conference fieldtrip. Abundant stalls with merchandise were there too; we also had numerous book signings and a few ‘show and tell’ events (relating to Dougal Dixon’s SpecBio projects and my in-prep textbook, among other things). For the second year running, Beth Windle brought along a TetZoo-themed cake; this one was devoted to the theme of plastic pollution, and a fine thing it was (even though I only got to eat a small bit of its neck and none of the actual cake). It was also a great social event with a lot of networking and pubbing going on. It’s a TetZooCon tradition that we make special little icons for our speakers and other presenters, and here’s the haul for 2018. Image: John Conway/Darren Naish. Virtually everything was filmed, but pressures of time and workload mean that I haven’t looked at a single bit of the footage yet. I should also add that my plan to record short interviews with people at the event (not just speakers) never panned out (even though I went round with a dictaphone and spare batteries in my pocket the whole while) as I just never had time. I should have given the job to someone else but never even thought about it. On that point, I enrolled some additional session moderators this year: thanks to Dani Rabaiotti, Beth and Georgia Harper. Georgia Witton-Maclean worked as official photographer. What with it being the fifth TetZooCon, the 2018 banner was a special one. Image: Xane/Michael Lesniowski. I will try and keep my recollections brief, otherwise it will take me several articles to get through everything that happened, and that’s not ideal. Already I’m aware that TetZoo is becoming a report of recent adventures more than a blog about tetrapods. Our venue was The Venue (part of the University College London complex at Malet Street) once more; attendee count was somewhere around the 150 mark. A huge quantity of palaeoart was both on show at TetZooCon 2018, and available for sale. Part of my personal haul from the meeting is shown at right. More on palaeoart below. Images: Darren Naish. Baleen whales, music in documentaries, Palaeoloxodon. After a brief intro in which John and I bigged up the fact that we were at THE FIFTH TETZOOCON, talks kicked off with polar biologist, geneticist and whale expert Jennifer Jackson. This was a remarkable and very well illustrated review of everything about baleen whale history you might imagine: their origins and phylogeny, competing views on the taxonomy and systematics of extant forms, population biology and phylogeography, biogeography and historical distribution, the impact of humans on their distribution and abundance, and more! Jenn and I have a long-standing disagreement over the interpretation of a particular sea monster sighting. It’s not impossible that this issue will be thrashed-out in detail at TetZooCon one year. Jenn Jackson gave the most enthralling presentation on baleen whales. Image: Darren Naish. In one of the most innovative and unusual talks of the event, professional composer Fiona Taylor discussed music for wildlife documentaries. This included a background to ideas, disagreements and arguments that have occurred around wildlife documentary soundtracks (“there are no bassoons in the Serengeti”, the Guardian reminds us) as well as demonstrations and explanations of how music can work (and not work), how it can be used (and mis-used), and how it can convey specific emotions or themes. It’s a huge relief to me that everything worked fine with the audio system during Fiona’s talk – it failed to work at all on the Sunday, on which more later. Anyway: my suspicion was high that Fiona’s talk would be really fun and interesting, and I’m pleased that I was right. And I’m not too ashamed to admit that I teared up at the piece of music accompanying the Sad Wolf. Oh… extra points, Fiona, for the Bad Wolf references. Fiona Taylor discusses the use of music in wildlife documentaries, and also shows us how it’s done. Image: Darren Naish. Steven Zhang gave us a specialist’s view of where we’re at with thoughts on the taxonomy, phylogeny, anatomy and palaeobiology of the straight-tusked elephant Palaeoloxodon. Coincidentally (…. or was it? ), one of the prizes we had for our quiz was the new Eofauna Palaeoloxodon model. Steven Zhang talks Palaeoloxodon - specifically, at this point, about the alleged survival of this animal into the Holocene (the evidence isn’t great). Image: Georgia Witton-Maclean. Bird evolution roundtable event. Our next event was the roundtable session on bird evolution. I was joined on stage by Albert Chen, Caitlin Kight, Hanneke Meijer, Robyn Womack and Glyn Young (all of whom were scheduled to give bird-themed talks the following day) as we discussed breaking news, current events, on-going research and future prospects relevant to bird evolution. We will definitely be doing roundtables again. When discussing the evolution of Strisores (the bird clade that includes swifts, hummingbirds and nightjars), Albert mentioned in passing that a hummingbird is “a dinosaur trying to be a butterfly”, an evocative line that struck a chord with the audience and even became a meme during the conference. A scene from the bird evolution roundtable event. From left to right: Albert Chen, Caitlin Kight, Hanneke Meijer. Image: Xane/Michael Lesniowski. Lucy Cooke and Katrina van Grouw. The excellent and hilarious Lucy Cooke was up next, speaking about her new book The Truth About Animals … aka The Unexpected Truth About Animals (Cooke 2018), depending on whether you obtain the UK or US edition. Lucy has a background in TV and film-making but switched track to bring attention to amphibian conservation. Today she writes about sloths, giant pandas, bats and all manner of other animals. It was a brilliant talk and definitely a highlight. Lucy was on hand afterwards to sign and sell copies of her book. Lucy Cooke (at right) signs copies of The Unexpected Truth About Animals. Image: Darren Naish. Following Lucy was Katrina van Grouw on another book-themed talk, this one devoted to her fantastic Unnatural Selection (van Grouw 2017). Selective breeding is very much a perfect illustration of evolution in action, and Katrina took us through remarkable examples from the world of pigeons, poultry, dogs, pigs, cats and other animals. The hamster gag was possibly inspired by a similar fish-themed gag employed by that Tetrapod Zoology guy. Katrina was also selling and signing her book. A brief initial take on Katrina’s book has already appeared here at Tet Zoo. 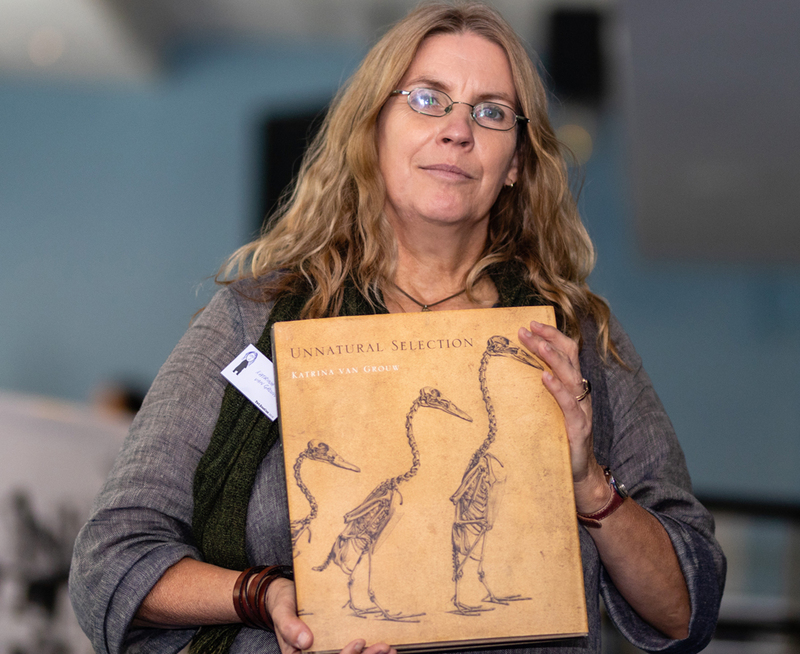 Katrina van Grouw and her fabulous book Unnatural Selection at TetZooCon 2018. Image: Xane/Michael Lesniowski. The Palaeoart Workshop – led by John Conway – featured talks from Luis Rey and Mark Witton in addition to an art-making event in which participants were invited to depict prehistoric animals in an unfamiliar style. Bob Nicholls was also in attendance. Unusual and often attractive artwork that resulted from the workshop was up on the walls for the duration – we sure do have a lot of skilled arty-types among us, but then we already know this from previous TetZooCons. Luis and Mark also had art on sale at the event, and Mark’s brand-new book The Palaeoartist’s Handbook (Witton 2018) (which I hope to see properly some time soon… hint hint) was the object of much discussion and interest at the meeting. I should also mention that Joschua Knüppe – he of palaeostream and much else new palaeoart-themed goodness online – was in attendance and showing people original art he’d brought with him. I was carrier for one of the few printed copies of Joschua’s new #Palaeostream: Sketches of Prehistoric Life book (Knüppe 2018), which is wonderful. Bob Nicholls of Palaeocreations was selling prints, including those featuring the cover and concept art for Naish & Barrett’s Dinosaurs: How They Lived and Evolved. Image: Xane/Michael Lesniowski. In order to pack in more stuff this year, we opted to have the palaeoart workshop running as a parallel stream to the rest of the conference. Not ideal, and it means that many of us – myself included – didn’t get to go as we stayed in the main hall for the other talks, but there you go. A very good run-down of what happened can be found in Marc Vincent’s article at LITC, if you’re interested. A selection of palaeoartists present at TetZooCon 2018 (and this isn’t all of them). Left to right: Luis Rey, John Conway, Bob Nicholls, Steve White, Mark Witton and Rebecca Groom. Image: Georgia Witton-Maclean. And what was happening in the main hall at the same time? PhD student and herper extraordinaire (it says so in October’s BBC Wildlife) Steve Allain gave a really interesting (albeit slightly scary and depressing) review of snake fungal disease. Steve will be back at TetZooCon in the near future to discuss his on-going work on introduced British midwife toads, mark my words. Ian Redmond. We were then on to my favourite talk of the meeting (no offence intended to our other very excellent speakers): Ian Redmond’s ‘The Reluctant Conservationist, 40 Years On: From Gorilla Parasites and Poachers to Virtual Safaris’. You’ll be familiar with Ian and his work if you know anything about primates, elephants, rhinos, or conservation in general. I first got to know of Ian due to his association with the late Dian Fossey in the Virunga Mountains of Rwanda, and maybe you did too; he was also on hand to advise David Attenborough and his team during the 1978 filming of that iconic scene with the mountain gorillas. Ian was also involved with the making of the 1988 movie Gorillas in the Mist. Ian Redmond talks about gorillas, Dian Fossey and conservation at TetZooCon 2018. Image: Xane/Michael Lesniowski. The talk itself was fantastic. Ian had brought with him his original field notes and read aloud the section relevant to what occurred 40 years ago on the same date. As it happened, it was a particularly eventful day, since Ian and his colleagues discovered, confronted and apprehended a group of poachers setting snares. He also discussed his work with the famous mining elephants of Mount Elgon and his encounters with forest elephants in general, his first-hand inter-species friendships with individual gorillas, and his on-going work on the preservation of tropical forests, a vital resource as goes the health of the entire planet and the function of our atmosphere and water cycle. Teaching local children the value of their gorillas and other wildlife is an essential part of current work. A small excerpt of Ian’s talk was filmed (very poorly) on my phone and streamed live: I’m hoping that we have the entire talk as I very much want to see it again. You can find out more about Ian’s VR work at www.vEcotourism.org, documentaries on www.ecostreamz.com and follow him on Twitter at @4apes. 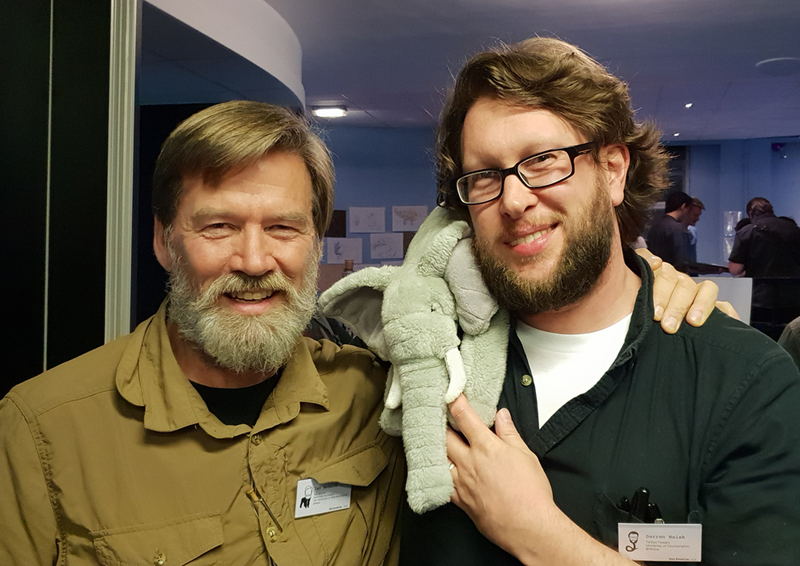 Ian Redmond, Darren Naish and Archie the Elephant (follow him on twitter @ArchietheEle) at TetZooCon 2018. Image: Darren Naish. Mark O’Shea and forensic historical herpetology. Ian’s talk was followed by one from another celebrity of the zoological world: herpetologist, author, explorer and conservationist Mark O’Shea. Mark’s talk was on forensic historical herpetology: on cases in which he (working with colleague Hinrich Kaiser) worked hard to track down the true geographic origins of worm-eating snake specimens that didn’t otherwise seem right given other knowledge of the group’s distribution, taxonomy and biogeography. Fascinating stuff. 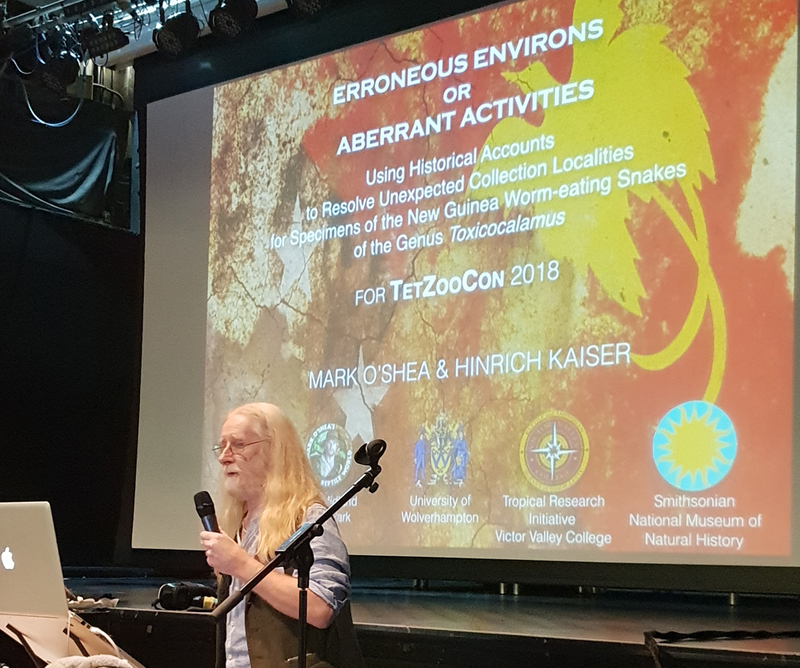 Mark O’Shea at TetZooCon 2018: Mark certainly won the prize for longest talk title. Image: Darren Naish. Mark also brought posters (pressures of running a conference meant I never got to have a proper look at them) and stock of his brand-new The Book of Snakes (O’Shea 2018). I purchased a signed copy, and it’s an amazing piece of work. I admire the format, design and fact that he’s consistently said interesting things about the 600 featured species. Yes, the photos are life-sized but this means (obviously) that – in many cases – it’s only the animal’s head and adjacent loop of its body that’s shown at full size, not the whole snake. Mark O’Shea’s 2018 The Book of Snakes, a must-have for those interested in reptiles. Image: Darren Naish. For the first time – yeah, there were a lot of firsts at this one – we finished the evening with both a drinks reception (which didn’t go exactly to plan but was still a thing) and a conference meal. The latter was popular enough (as in, a sufficient number of people wanted to come along) that we could potentially have booked another 20 or more places and filled them. An alternative meal was arranged by Beth Windle and places there were filled as well. I can’t remember what happened after the meal, but I know we got back home. So… so far so good, we’d survived the first day, and it had worked pretty well. Bird evolution session. And so to Sunday. Due to a stupid mistake that neither John nor I caught in time, our schedule had things kicking off at 9am, which won’t happen again. The first several talks of the day were devoted entirely to bird evolution: both deep-time, phylogenetic and palaeontological stuff as well as evolution in the human era. General themes of the subject had of course been outlined the day before in the roundtable session. All of the bird talks were really strong. Robyn Womack’s cover slide. Image: Georgia Witton-Maclean. Robyn Womack reviewed what we know about biological clocks in birds. Her research is on how birds are adapting (or not) to light pollution, the results showing that some birds are undergoing a modification in their timetables and behaviours while others are not. Albert Chen gave us an overview of crown-bird evolution: he covered bird survival and extinction across the KPg event, the shape of the neornithine tree and competing models on how crown-birds might have evolved. His formative role in TetZoo Time and special guest article at TetZoo (ver 3) were mentioned in the introduction…. and then there were the memes. I don’t want to spoil the surprises, but they were good. Ok, I have to give one away: an enantiornithine says “Mr Vegavis, I don’t feel so good”, and turns to ash. TetZooCon 2018 was the Albert Chen TetZooCon, and he is quite literally wearing the t-shirt. Image: Darren Naish. Caitlin Kight followed with ‘Sonic Doom’, another talk on the effects of anthropogenic disturbance on birds. A substantial but pretty obscure literature shows that noise pollution can result in a huge number of biological consequences for birds, and there can also be unexpected knock-on environmental effects due to how and where birds feed and forage. Caitlin also bought along copies of her very nice 2015 book Flamingo (Kight 2015); I got her to sign mine. Caitlin was followed by Hanneke Meijer, who discussed the fossil birds of southeast Asia. It’s not just giant marabou storks on Flores; she also spoke about vultures, the mysterious absence of chickens from the prehistoric sediments of the region and much else besides. Hanneke Meijer talks about the giant marabou storks and other birds that lived alongside the hobbits (and other mammals) of Flores in the past. The artwork is by Simon Roy. Image: Darren Naish. The final bird talk – ‘What a Boring Duck: Why Southern Hemisphere Ducks Are So Dull’ – was by Glyn Young of the Durrell Wildlife Conservation Trust. Long-time TetZoo readers will know how much I love ducks (here’s the proof). A traditional view that the Northern mallard Anas platyrhynchos is the Best Duck and that all other ducks find it irresistibly magnetic (like, sexually) – promoted by Konrad Lorenz and those who followed him – is just not accurate, as established by Glyn’s research on Meller’s duck A. melleri. 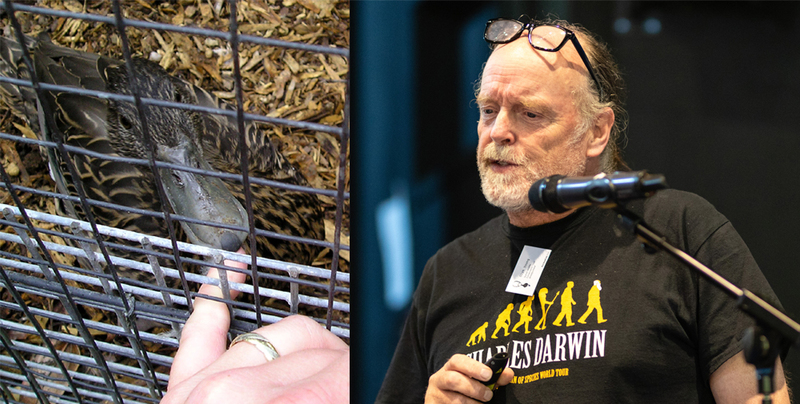 It’s thanks to Glyn Young that I have a great interest in Meller’s duck (at left is a captive individual at Bristol Zoo, biting my finger), so it was great to have Glyn himself speak about this species (and others) at TetZooCon 2018. Images: Darren Naish, Xane/Michael Lesniowski. Aron Ra. Yes, I said ARON RA. Aron was at TetZooCon to discuss his new, incredibly ambitious and extremely worthy Phylogeny Explorer Project, an interactive, searchable database that is essentially an annotated, navigable, online tree of life – exactly the sort of thing the internet needs. Aron’s team of backers and colleagues were also at the meeting: the first time they’ve all been physically together in the same place, I believe. Aron discussed previous efforts to provide searchable versions of the tree of life to online public use (like the Tree of Life web project and Mikko’s Phylogeny Archive) and also explained why such a project is worthy. It was a great talk. Aron was also selling copies of his book Foundational Falsehoods of Creationism (Ra 2016). Aron Ra at TetZooCon 2018: at left, with his 2016 book; at right, with Naish. Images: Georgia Witton-Maclean, Darren Naish. A Speculative Biology Discussion. 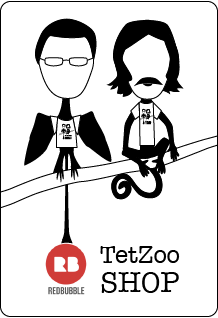 The very first TetZooCon – the one of 2014 – included a talk from me on speculative zoology (you can see it here), so it only seemed fitting that the fifth of our meetings revisit the subject, this time in more ambitious fashion. Accordingly, we had an on-stage discussion featuring me, Dougal Dixon and Gert van Dijk. You’ll know who Dougal is (if not, see my interview with him here and my report on the After Man launch event of September); Gert is the author and creator of the Furaha website and the SpecBio-themed blog Furahan Biology and Allied Matters. From left to right: Gert van Dijk, Darren Naish and Dougal Dixon on stage during the SpecBio discussion at TetZooCon 2018. Dougal Dixon illustrations relevant to (but not included within) After Man are on the screen behind us. Image: Georgia Witton-Maclean. A view of the audience, taken from the stage. Note that most people have their hands up. Image: Darren Naish. As mentioned above, this section of TetZooCon was enhanced by Dougal’s bringing along of various original pieces of art, imagery and content relevant to After Man, The Future Is Wild and Green World. As discussed in a previous article, some of this was on show at our recent event at Conway Hall, but only some of it. Dougal was also selling and signing copies of the 2018 edition of After Man (Dixon 2018). Dougal Dixon with copies of the 2018 Breakdown Press edition of After Man… and note the exclusive DVDs as well. Image: Georgia Witton-Maclean. Dinosaurs in the Wild, the quiz, the fieldtrip. The very last talk of the day was next: it was mine on Dinosaurs in the Wild, the immersive, interactive, travelling exhibit that treated visitors to a view of life in the Cretaceous where time-travel has been invented. My aim here was to discuss the backstory to the whole thing and explain why we decided to depict the animals we did, and what decisions we had to make when reconstructing them. A short movie (and one hilarious joke) were, sadly, ruined by the fact that – for reasons beyond our control and unrelated to the function of the conference laptop – sound was no longer functioning at the venue, so I had to improvise and do the audio for the movie myself. Among other things, the talk covered tyrannosaur facial tissue, terrestrial stalking azhdarchids, cuddly mosasaurs, nose balloons in ornithischians and much else. Behind-the-scenes discussions relevant to Dinosaurs in the Wild continue, and we hope to have news at some point. Just some of the prizes available to quiz winners this year. Thanks to those who made the many kind donations. Image: Xane/Michael Lesniowski. Sunday also finished with a quiz. 30 questions on all manner of things relevant to the TetZooniverse, and with many of the questions relevant to issues covered in the talks of the conference. First place was tied by Albert Chen and Lars Dietz, with Albert winning a tie-breaker question (on genome size in axolotls). Our selection of amazing prizes were very generously provided by Everything Dinosaur, the team at Dinosaurs in the Wild, Katrina van Grouw and Crowood Press (publishers of Mark Witton’s The Palaeoartist’s Handbook). The quiz is never easy, but even so there are always people who get scores in the 20s, and well done and thanks to all who played along and enjoyed it. Well done Albert, the 2018 quiz winner. He chose the Fauna Figures bichir and Dinosaurs in the Wild Dakotaraptor. Image: Georgia Witton-Maclean. After an evening spent in the pub… again, we got back to base at some point, and thanks to those who bought me beers… there was one thing left to do on Monday, and this was to lead the post-TetZooCon fieldtrip to Crystal palace. There was a small charge for this, the money raised being donated to the Friends of Crystal Palace Dinosaurs where it will assist with renovation work on the models. I could talk a lot about the stuff we looked at and spoke about but an article dedicated to the Crystal Palace models and to another recent event is due to appear here soon. 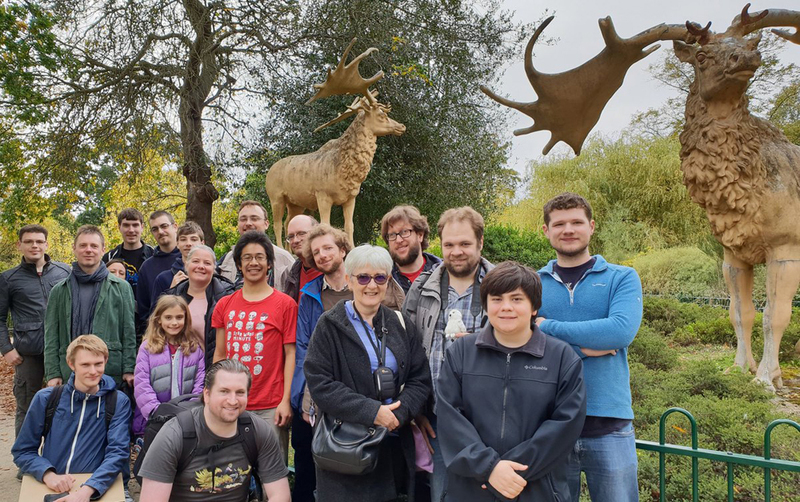 The post-TetZooCon fieldtrip to Crystal Palace. It isn’t coincidental that we stopped to take the group photo at the Megaloceros models. Image: Will Naish. Until next time. And that about draws things to a close. Running TetZooCon this year was extremely stressful – way more so than in previous years – and I now understand why people stop running conferences and conventions. But I don’t want to complain, because none of the problems really affected what happened and it all ran pretty smoothly in the end. We had a great crowd, a strong turnout, and a lot of positive feedback. The vendors and merchants did pretty well, book signings and sales mostly went really well (I shifted all copies of my Dinosaurs: How They Lived and Evolved, the second edition), and the talks were outstandingly good. Just some of the books I got signed by their authors at TetZooCon 2018. Image: Darren Naish. It only remains for me to thank everyone who helped: huge thanks to all of our speakers and presenters, to Jenny, Will and Tilly for help, to our moderators Beth, Dani and Georgia, to the other Georgia for photography, to Xane and everyone else who took photos, shared material online and tweeted (sooo much tweeting! ), to Luis, Mark, Bob and everyone else involved in the palaeoart workshop, to The Venue staff for assistance, and to everyone who attended, came on the fieldtrip and purchased stuff. The fifth TetZooCon has happened. Now to start planning for the sixth. Cooke, L. 2018. The Unexpected Truth About Animals. Penguin Random House, London. Dixon, D. 2018. After Man: A Zoology of the Future. Breakdown Press, London. Kight, K. 2015. Flamingo. Reaktion Books, London. Knüppe, J. 2018. #Palaeostream: Sketches of Prehistoric Life. Studio 252MYA. O’Shea, M. 2018. The Book of Snakes. Ivy Books, London. Ra, A. 2016. Foundational Falsehoods of Creationism. Pitchstone Publishing, Durham, North Carolina. Van Grouw, K. 2017. Unnatural Selection. Princeton University Press, Princeton and Oxford. Witton, M. 2018. The Palaeoartist’s Handbook. The Crowood Press, Marlborough. Young, H. G. & Rhymer, J. M. 1998. Meller’s duck: a threatened species receives recognition at last. Biodiversity and Conservation 7, 1313-1323. Posted in TetZooCon and tagged with TetZooCon. October 12, 2018 by Darren Naish.